The Intel DC S3500 240GB is a lower cost SSD that is focused on read-heavy workloads. While marketing powers tend to stress the need for high write endurance, there are a number of applications that simply do not need to handle that many writes. 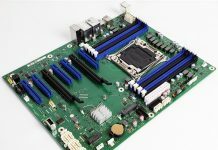 The Intel DC S3500 240GB has power loss protection like the Intel DC S3710, S3700 and S3610 series drives. It is rated for 140TB written which is more than most OS SSDs or read-application SSDs will experience. Today we are going to run it through our quick benchmark suite along with a few other common boot options. We are using a SAS controller so one cannot compare results directly to consumer-driven setups where a SATA SSD is connected to an Intel PCH port. There is a latency penalty for going over the PCIe bus to a controller to SAS. It also is a reason NVMe is going to be a game changer in the enterprise storage space. For our quick tests during this part of the series we will just provide the quick benchmarks with only a bit of commentary. The results should be fairly straightforward and we have added a few results for comparison purposes. AS SSD is a solid benchmark that does not write compressible data to drives. The result is perhaps one of the best workstation SSD benchmarks available today. A few of these SATA drives had a rough time with our higher pre-conditioning combined with the LSI controller. The Intel DC S3500 240GB managed to handle the rigors fairly well. 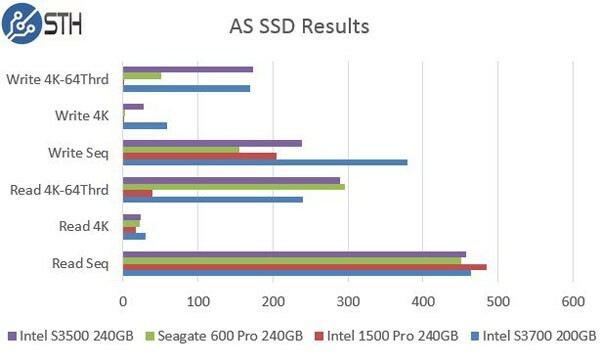 It was either the top or second to top drive in the group for each AS SSD benchmark. CrystalDiskMark is another benchmark which gives non-compressible read/write numbers. This is in contrast to the ATTO Benchmark used by LSI/ Sandforce and its partners when they market a given solid state drive. 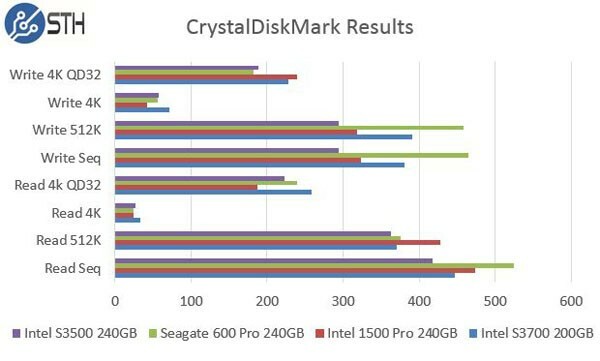 CrystalDiskMark showed a clear resurgence of the Seagate 600 Pro 240GB drive. We see some of the limitations of the Intel controller and lower capacity drives. Intel controllers are known to be a bit slower with less NAND onboard however the S3500 240GB drive performs relatively well in most tests. 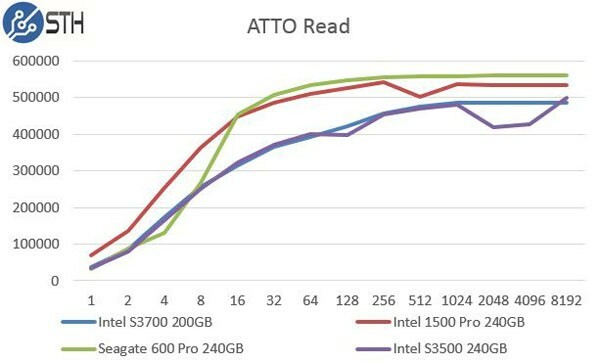 The Intel DC S3700 200GB drive did outperform the S3500 240GB in every category. The value of the ATTO benchmark is really to show the best-case scenario. 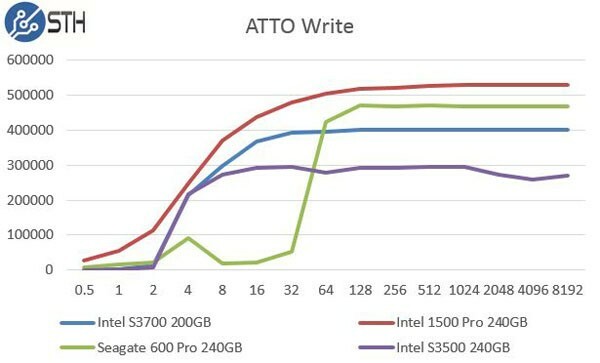 ATTO is known to write highly compressible data to drives, which inflates speeds of controllers that compress data like LSI/ SandForce does prior to writing on a given solid state drive. On the ATTO read side we see some of the more consumer oriented drives put up some significantly higher numbers. On the other hand, we can see very close groupings between the S3500 and S3700 in our tests. 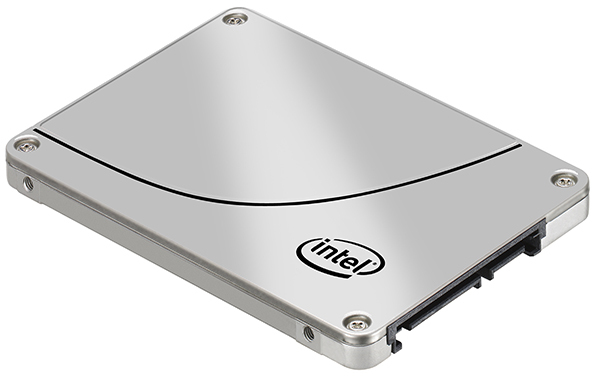 For a smaller capacity drive (these days) the 240GB Intel S3500 is a solid offering. Our review sample we purchased for under $0.50/GB. With about 50 of the S3500 drives in different STH systems over the past few years, and all have performed consistently and reliably. That theme seems to be why they are widely adopted by major OEMs such as HP and Dell. While not the fastest drives, sometimes reliable, inexpensive and “good enough” is a good combination. All of the posted speeds are fine for most read optimized workload and the performance curves were very consistent on LSI controllers. That is something that many consumer drives are unable to achieve. Thanks for catching the typo Paul. Misplaced the decimal! Much appreciated.